Afrin Original 15 ml Chute - 507 Fl. Oz. Phillips Milk Of Magnesia Original Liquid - 4 fl. Oz. A and D Original Ointment - 1.5 Fl. Oz. Coppertone Ultra Guard Lotion SPF50 - 8 oz. Dr. Scholl Od Deo Spray Bonus Pcn 9145 Foot Care Products - 4.7 Oz. 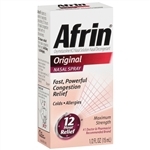 Afrin Original 12 Hour Nasal Spray - 15 ml.